It's party time and as folks are gathering around, what do they look for? Appetizers! I'm a big fan of appetizers and can easily make a meal out of a handful of them. For me, a good spread of appetizers balances out different textures, flavors, colors and even temperatures. 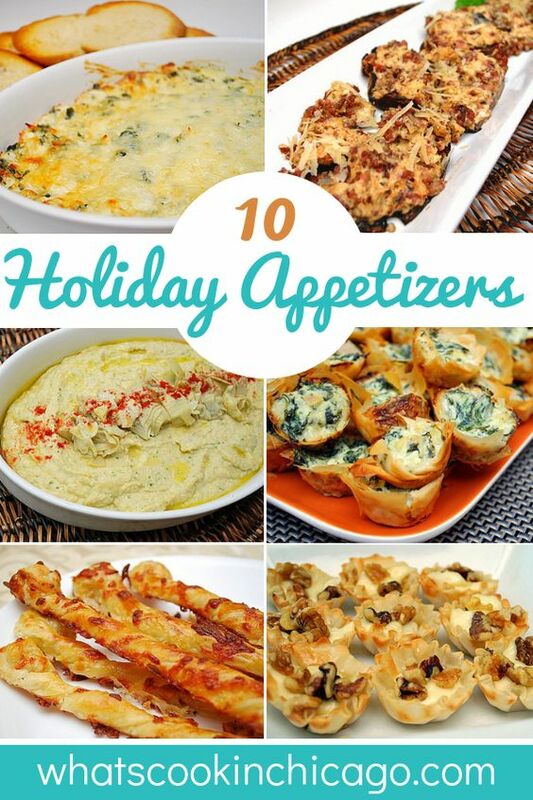 Here are 10 Holiday Appetizers to whet your appetite for the upcoming gatherings this season! These will go perfectly with a few wedges of good cheese, fresh fruit, toasted nuts and maybe a few slices of prosciutto, sopressata or even summer sausage. Pairing these cheese straws with these items is nearly effortless and allows you more time to focus on your holiday meal. If you love the classic Greek dish, Spanakopita, you'll love this bite sized version. 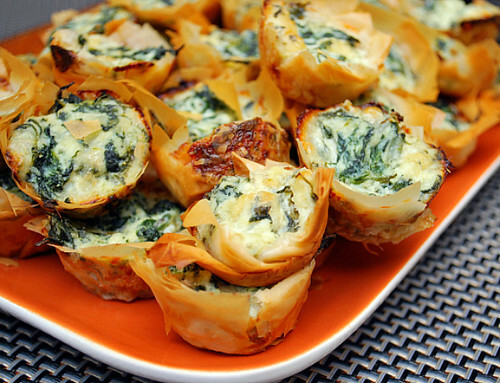 Spinach and feta cheese are combined and baked into buttery layers of phyllo dough in a mini muffin tin. You can prepare these in advance and bake just before your guests arrive so they're nice and hot when served. When you're hosting a party, convenience is an important factor right? 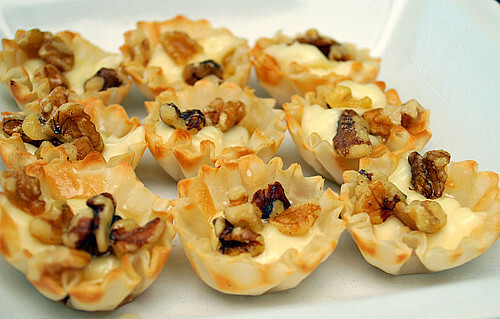 With these tartlettes, take advantage of store bought phyllo shells which will save you time. There's nothing but a simple assembly to create these tartlettes - just fill the phyllo shells with your favorite creamy brie, toasted walnuts and a sweet drizzle of honey. 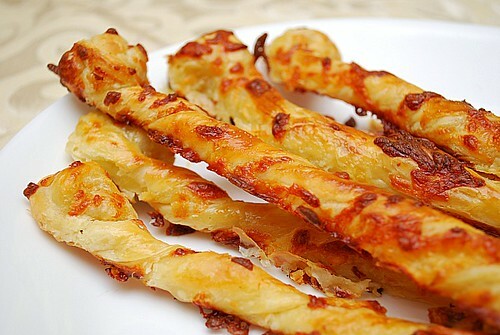 It's this time of year you'll see a lot of puff pastry used in making appetizers. It's no wonder since the buttery flavor and crispy texture makes it a great ingredient to work with for both sweet and savory tastes. In this version, I used homemade pesto, sun dried tomatoes, pine nuts and a blend of Italian cheeses. Feel free to use what you have on hand and be creative! I love hot dips and this is one of my faves. 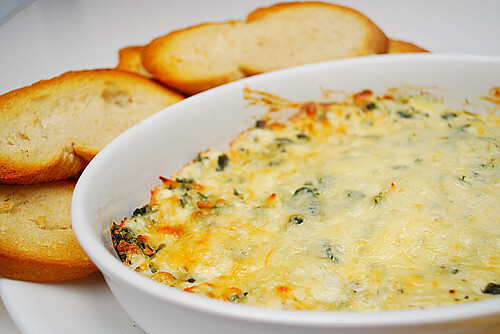 Spinach and artichoke is a classic dip and this version can be made in advance and popped into the oven before guests arrive. 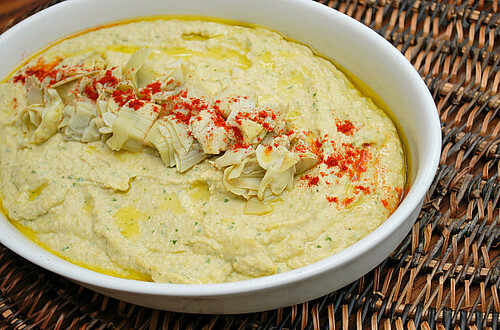 You can also adapt this to warm in a small crockpot so that the dip stays warm throughout the party. Just prepare the recipe and transfer the dip into a small crockpot, turn it on about an hour before guests arrive and watch folks scarf it down! 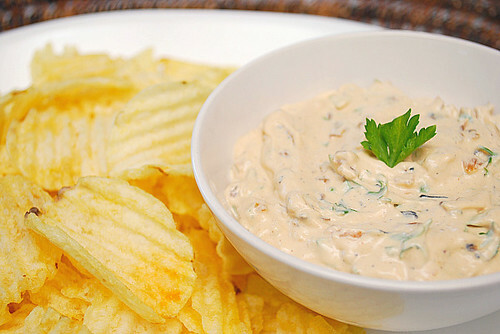 Forget those sodium laden packets of onion soup mix to make that ever popular french onion dip. Instead, caramelize onions on the stovetop for a richer flavor to make the dip from scratch. Besides, if you make a big batch of caramelized onions, you can use some in the holiday dishes you're already preparing! If there's one appetizer that doesn't last very long at our house, it's these stuffed mushrooms. 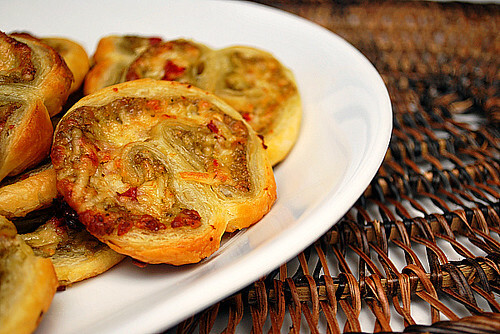 Filled with a blend of cheeses and crumbled Italian sausage, it's no wonder they're addictive! This recipe uses large portobello mushrooms instead of the usual white button mushrooms, but you can definitely use white or cremini mushrooms if you prefer. Regardless, it's the stuffing that makes it so good! Whatever appetizers you decide to serve guests this holiday season, keep in mind a balance of warm and cold options, meaty and vegetarian choices, crispy and creamy eats, and a spread that's also colorful and inviting. Appetizers shouldn't require too much effort either since you'll want to spend more time on the main and side dishes on your holiday table. So have fun and whet those appetites with something delicious! Can I come to your house? These look amazing! 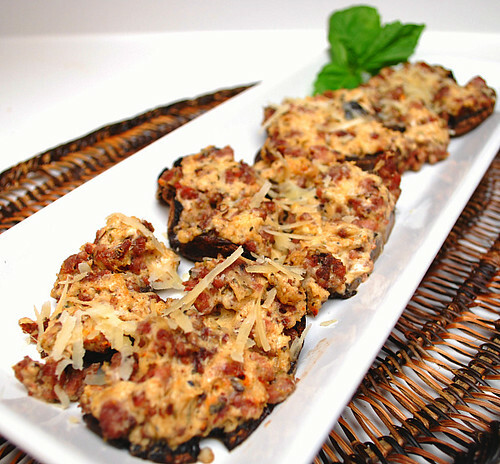 I may make the stuffed mushrooms for my mom when I go home next weekend as those as one of her favorites! Personally I think the Spinach Artichoke dip would be my favorite. Love your table set-up photo. 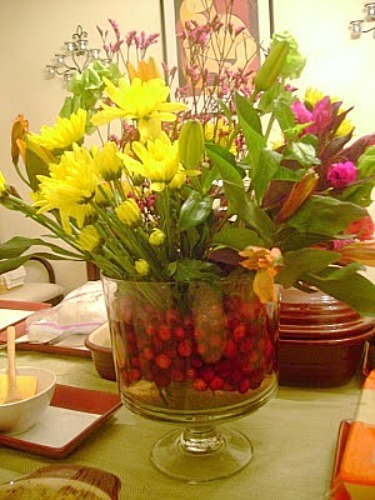 Are those cranberries in the flowers? As a rep, I',m excited to see all the Pampered Chef products you have! Enjoy! Seriously?!? 10 scrumptious recipes in one post? This is all anyone needs to throw a fantastic party. Every single one looks delicious. Thanks for a full party menu! Wow, thanks so much, you have saved me a lot of key strokes looking for appetizers. Oh gosh, thanks so much for putting all these on one page! Makes it much easier to find the recipes I want. 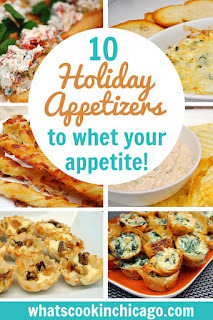 Actually, all of these look great, but I made the artichoke hummus dip and lemme tell you - it was a huge hit at my party! Can't wait to try some of the others you have listed!